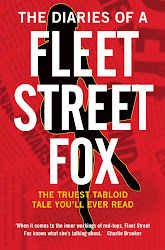 fleet street fox: Press on. YESTERDAY I went to church. (I am as shocked as you, but it's all right because afterwards we all went to the pub and got drunk). I'm not religious and I don't believe in God, but there is one place of worship I will gladly enter and that is St Bride's off Fleet Street, the journalists' church. It is a beautiful building, designed by Sir Christopher Wren, and its tiered spire is the inspiration for traditional wedding cakes. Fleet Street is where the profession of journalism began 500-odd years ago, and from where it has spread around the world. It remains the spiritual home of every hack on the planet, and not just because of the pubs. Last night there was a memorial service held to mark the sacrifice and remember the names of all those reporters and photographers who have died in the course of their duties in the past year. The church was packed with journalists from tabloids, broadsheets, television and radio; foot soldiers, executives, foreign desks, and editors. Some had been wounded in the course of their work and others had lost comrades. The News International benches were a little empty, but then quite a lot of them have bail conditions to comply with. The topic of journalists dying in harness does not always cause much concern, because as ITV news presenter Mark Austin told the church few people have sympathy for those of us who run towards the kind of things everyone else is busy running away from. You might think we normally die in the crossfire; but as Mark also pointed out of those journalists killed in the past decade 70 per cent were murdered in cold blood. And of their killers, 80 per cent have not been brought to justice. Being a journalist is a great privilege, and you get to do and see wonderful things. But you are also treated as less than human. If I am assaulted during the course of my job the police are unlikely to prosecute, and in many parts of the world if a reporter is shot by someone angered by what they have written it is regarded as their own silly fault. Each one, however, is still a crime. Photographers in the Vietnam War showed the American public the truth of the conflict, and helped turn the tide of public opinion. Journalists embedded with the troops in Iraq and Afghanistan have done the same, despite the constraints of their position. Hacks operating as best they can under oppressive regimes in order to spread the truth put their lives at risk every day, and they are rarely thanked. Britain is 19th in the Press Freedom Index, below Estonia and Lithuania but thankfully above the likes of North Korea. Anti-terror legislation, stalker laws and the new Bribery Act make it much harder to do our jobs these days, especially as none of these statutes was designed with us in mind and can be used by the idiotic or the guilty to stop the unwanted attention of journalists. After the phone-hacking scandal the bar for prosecuting journalists - whether it's hacking, corruption or anything else - seems to have dropped even lower along with our reputation. We are not all changing the world, and we do not fight the good fight as often as we struggle to come up with a funny picture caption. But we do bear witness to all the things you want us to and some of those you don't, and we bear the scars of that too. Tomorrow everyone is going to stop and remember the sacrifice of service people in the name of freedom. Journalists don't get included in that, so please have a few seconds' silence and thought today for those in my trade all over the world who have given the same in the past 12 months. Fleet Street has been spread far and wide, but we are still here. You can beat us, shoot us, pummel us, sue us, and you can legislate against us, but we will always be here.